Simon & Schuster Books for Young Readers, 9781416924661, 40pp. With no more than two words on each page, wildly colorful illustrations tell the story in this playful book about a family backyard barbeque and a spotted dog who only wants a burger. Dad and son prepare the juicy morsels of meat as the dog looks on, his anticipation (and drool) building each time a burger is served to a guest. And just when it seems the poor mutt is out of luck, a surprise ending leaves everyone satisfied. 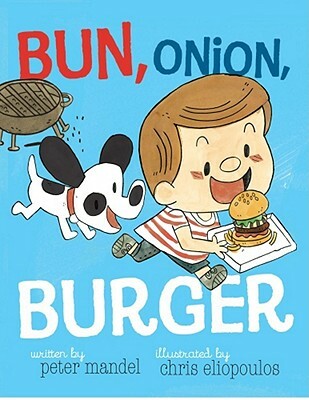 Readers will delight in the dog's suspense, and with fewer than forty-five words throughout the text, Bun, Onion, Burger makes a perfect read-aloud treat for toddlers.